Filmmaker Werner Herzog was in a playful mood Monday evening in a Q&A following a BAFTA screening of his new movie “Rescue Dawn” at the Curzon Soho in London. 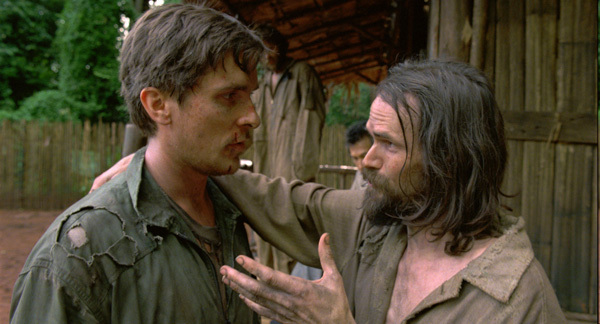 An often harrowing but ultimately uplifting real life tale starring Christian Bale as an American POW in Laos in the mid-1960s, the film has a surprising number of comic moments. Bale’s vivid description echoes the scene in Steven Spielberg’s “Empire of the Sun” when the kid he plays watches planes from the roof of a bombed building. When asked about it, Herzog said that had nothing to with it, the scene derived only from Dengler’s memoirs, which were seen in Herzog’s documentary 1997 documentary “Little Dieter Needs to Fly.” Still, fans of what remains Spielberg’s finest picture will make the connection. Bale and Zahn, and a frighteningly skinny Jeremy Davies (pictured with Bale), are terrific in a film that did not really get a shot at the U.S. box office in the summer. It opens in the U.K. on Nov. 23. Peter Zeitlinger’s cinematography in the jungle is outstanding as is Klaus Badelt’s sturdy and spiritual score with contributions from Dutch cellist and Herzog regular Ernst Reijseger. This entry was posted in Film, Reviews and tagged 'Rescue Dawn', BAFTA, Christian Bale, Dieter Dengler, Erns Teijseger, Jeremy Davies, Klaus Badelt, Mark Kermode, Peter Zeitlinger, Steve Zahn, Werner Herzog. Bookmark the permalink.